|Adopt-a-Reader builds leadership skills of parents by offering opportunities to share their knowledge. Adopt-A-Reader is presented by the Mothers Matter Centre and First Book Canada with financial support from TD Bank. The Adopt-a-Reader Campaign provides an opportunity for HIPPY families to “adopt” other parents in their community for a three-week campaign that focuses on parent-child bonding through reading. The mother-to-mother community-centred approach allows the campaign to reach even the most isolated families. 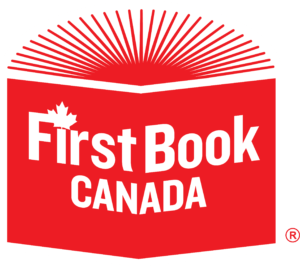 Each adopted family is generously provided books from First Book Canada. During the campaign, which is usually held each spring, families are encouraged to spend approximately 10-15 minutes a day reading with their pre-school aged children. The ultimate goal of the Adopt-a-Reader program is to encourage 1,000 families (500 HIPPY families and 500 non-HIPPY families) to read a total of 150,000 minutes over 15 days. 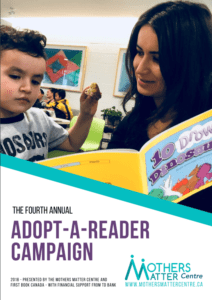 In February 2018, the Mothers Matter Centre launched its fourth annual Adopt-a-Reader Campaign. We are happy to report this year more than 1,400 adopted families shared over 481,320 minutes of reading with their children (an increase of 149,219 minutes from 2017). The campaign concludes with a “Celebration of Reading” event. This year’s events were a huge success filled with food, laughter and connection between families. HIPPY curriculum books are available to everyone! If you are interested in buying a book for a child in your life or donating a book to a child in need, please visit our bookstore here.